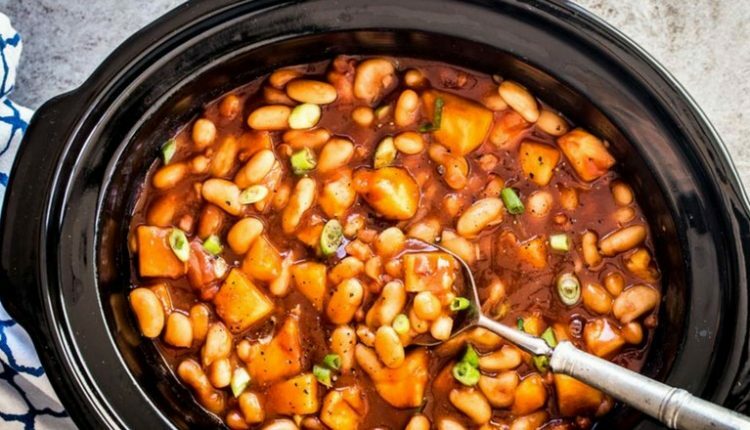 Put These Ingredients In Your Crock Pot And Watch Out! I grew up eating Pork And Beans that came in a can. My mom would always have a few cans packed when we went camping and I remember her opening the lid and letting the contents fall into a pan, the scooping out the pat of white fat before heating it up. We usually ate the bowl of pork and beans with hot dots cut up in it. Hey, no judgment for the Beans and Weenies staple that graced our picnic table, we were camping remember? When we moved to Minnesota they dumped cans of pork and beans into a casserole dish, stirred in BBQ sauce and diced onions and baked them. I love the idea of having a Hawaiian style dish that is based off the familiar dish. Perfect for serving with hamburgers, hot dogs, chicken or whatever else you want to put on the grill. You could just make this on the stove top but it is even easier to just put everything in the crock pot and let it simmer. So next time you are invited to a tailgate party, a birthday party, or anything in between, go ahead and sign up to bring a side dish that is sure to be a hit. But, just between the two of us, I would definitely leave out the hotdogs! Quick tip: Think about what you would put on a kabob. Add in diced onion and even diced bell pepper. No Wonder My Aunt Hazel’s Cupcakes Were So Popular. She Had A Secret Ingredient!